US army sniper Quinn McKenna (Boyd Holbrook) witnesses an alien spacecraft crash-land while in the field in South America. After sending an alien set of armour back home, he is promptly captured and interrogated by a secret government agency before breaking free with a team of fellow military prisoners and getting caught in a race to protect his autistic son – who now has the armour delivered to Quinn’s home, and is being hunted down by more aliens and the US military. This is one ungodly mess. 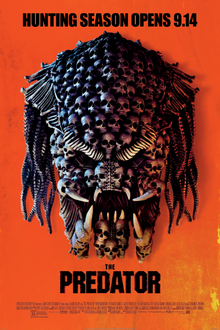 The Predator is scrappily assembled, with footage visibly missing, a strangled and limp pace, a confused narrative, and generally unlikable characters. Were it not a high profile studio sequel it would not have hit anybody’s radar at all. I generally approach a new film with three questions: what is the filmmaker attempting to do? Do they succeed in that goal? Finally, is the film actually any good? Well if the answer to the first question is ‘a Predator sequel’, then the answer to the second is clearly a technical ‘yes’ given that the titular alien beast does appear – but as for the third? The Predator is jaw-droppingly risible. More than that, it is a multi-faceted disaster: it fails on so many different angles and layers. Here is the essential problem with Predator, a science fiction movie franchise now up to four instalments – six if you include the two Alien vs Predator films from 2004 and 2007: it is a piece of production design looking for a good story. Easily the most memorable aspect of the original film, which featured Arnold Schwarzenegger and a team of special ops soldiers being stalked and killed by an alien hunter, was the design of the alien itself. It was tall and muscular, lizard-like, and featured a bizarrely off-putting face with mandibles, pin-sized eyes, and a rattling sort of insect-like chattering whenever it got excited. It looked, sounded, and moved brilliantly. It immediately attracted a fan-base, and led 20th Century Fox to attempt three times to kickstart it as a proper ongoing franchise. The first sequel saw the studio drop Schwarzenegger – they were unwillingly to wait until he had completed Terminator 2 before shooting – and replace him with an urban-set Danny Glover, and an all-round underwhelming story. The second, which came years later, went for a pulp route – kidnapping a range of human killers and throwing onto an alien planet to be hunted. It was arguably a less interesting film than Predator II, even though it produced more in-the-minute thrills and action beats. Personally I find the best Predator sequel to be Paul W.S. Anderson’s Alien vs Predator, since it makes no attempt to be another other than fast-paced pulp action-horror. It does exactly what it says on the tin, and clearly has a ball doing it. With The Predator, writer/director Shane Black (Iron Man 3, The Nice Guys – he also acted in the original Predator) makes the critical mistake of making things too complicated. The appeal of an alien monster sneaking around murdering humans gets buried beneath a confused and poorly explained story of rival alien clans, genetic manipulation, government cover-ups, and broken families. There is simply too much going on to make any sort of impact, and a studio-mandated series of edits and reshoots has rendered the bulk of it nonsensical. More than any of its predecessors, The Predator is also actively franchise-building. It keeps one eye on whatever is going to happen next, and that is to the severe detriment of the film actually being made. The characters are resoundingly weak, either underdeveloped – as is the cast with Olivia Munn’s earnest Dr Casey Brackett – or actively unlikable – like Boyd Holbrook’s smug Quinn McKenna and, indeed, his entire team of mercenaries. Jacob Tremblay is bizarrely inconsistent as McKenna’s autistic son Rory. One has to assume the varying symptoms of his autism are the result of reshoots, because the alternative is shockingly bad filmmaking on Shane Black’s part. The use of Rory’s nature is crude and unpleasant: using him as a ‘magical disabled’ trope and giving him an innate connection with the Predators through the equipment his father sent back from South America. The film also uses one of the mercenaries (played in this case by Thomas Jane) for comic relief by giving his character Tourette’s Syndrome. It is crude, inaccurate, and creatively lazy. The plot, which is unnecessarily complicated – not to mention obfuscated – makes a critical error in assuming ‘bigger is better’. The film’s original Predator is superceded by an even taller, more destructive iteration, and rather than up the ante it disrupts the film’s narrative flow. By the film’s dreadful denoument, which promises a sequel I guarantee half the audience do not want to see, things have moved from disruptive to utterly ridiculous. The Predator is still a masterpiece of science fiction design, and we shall always have John McTiernan’s tight, aggressive 1987 original. From here on in, however, I really think it is time to let this franchise die.